Tuesday night found my kitchen looking something like a scene from a Barefoot Contessa tv episode. A roast chicken was in my oven, its’ aroma spilling out and scenting the whole house. The white chairs around the kitchen island were scattered, out of place and arranged so all were facing the oven and the stove. The charcoal stone island was decorated with bowls and implements. 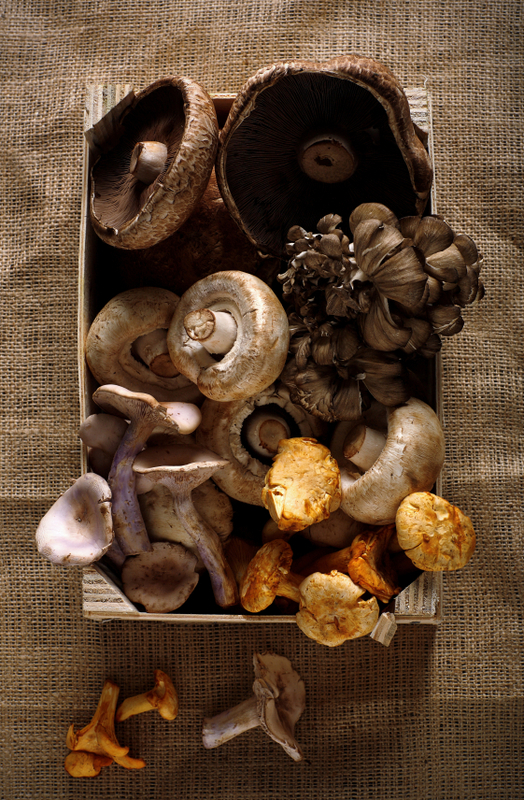 Wild mushrooms were sliced, their varied brown tones decorating a stainless steel bowl. The lemons sat, with garlic beside them, the only color on a white cutting board. Purple hued shallots were chopped and waiting in an azure bowl. Fresh thyme leaves, recently stripped from their stems, lay green and fragrant in a glass bowl the size of a child’s fist. The doorbell rang. The first student had arrived. In case you hadn’t already figured it out, I taught my first cooking class in my kitchen Tuesday night. And, like the paragraph above, getting ready for the class was a lot about setting a stage. The only difference was that eventually a live audience of 14 intrepid ladies would show up and expect to learn something- not from Ina, but from ME! But, no pressure, no pressure. Let me just say for the record: planning for and demonstrating how to make four dishes in 90 minutes is quite a feat-one that should not be underestimated. But I digress. The fourteen fab ladies arrived right on time and we got down to business. It all went swimmingly and was even fun thanks to the girlfriends (you know who you are!) who were there rooting me on. Given that cold weather is around the corner, I decided that we should dive head first into fall recipes. So, we roasted chicken (A little kitchen magic helped here. I had started one in advance and prepped the second for the crowd), made Carrot Ginger Soup, a Wild Mushroom Gratin and finished with Apple Crisp for dessert. All along the way, we sampled what we made. Oh, and did I mention that everyone had a glass of wine? What’s not to love, food, wine and a kitchen full of ladies! All in all, it was a terrific night. By far the favorite dish- the one that had nothing left when everyone left-was the Wild Mushroom Gratin. I must say, this is a winner of a dish. Besides being fantastically delish, it can be made 24 hours ahead of time- so it is perfect for entertaining and for major holidays. Try it. I am quite sure that, like the ladies who came to my class, there will be nothing left at your house too! In a large pot of boiling salted water cook pasta to just barely al dente. Drain, rinse and set aside. Heat the oil in a large sauté pan. Sauté the shallots until soft. Add the garlic and cook for several minutes. Add the mushrooms and thyme and cook until mushrooms juices evaporate-about 15 minutes. Salt and pepper to taste. Add cream and cook for 2-3 more minutes until the cream is warm. Toss pasta with mushroom sauce. Place mixture in a large oven-proof casserole and top Parmesan and Gruyère (may be made to this point and refrigerated for up to 24 hours) and bake for 30 minutes. Note: If you have made this in advance, add 15 minutes to the oven cooking time, as the mushroom mixture will be cold. This entry was written by Caroline, posted on September 24, 2010 at 5:22 pm, filed under comfort food, cooking, entertaining, pasta, sides, vegetarian. Bookmark the permalink. Follow any comments here with the RSS feed for this post. Post a comment or leave a trackback: Trackback URL.